Leave the mainland behind, switch to island-time and get ready for simple pleasures like crystal clear waters and pristine natural beauty. Ease into the relaxed Queensland atmosphere and soak up the sun as you set out for adventure, discovery, and more than a little fun. 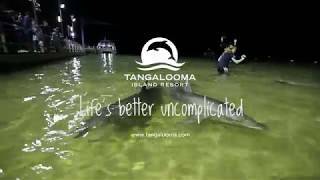 The untouched national and marine parks of Moreton Bay make Tangalooma one of a few destinations in the world where visitors can interact with native wildlife in their natural environment, including wild bottlenose dolphins who visit our shores each evening to be hand-fed by resort guests. 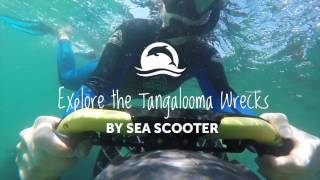 Tangalooma has lots of activities on offer and more than half are free. 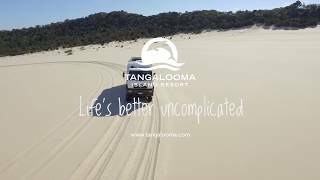 Choose from sand tobogganing on the Desert Safari tour, Quad biking, Snorkelling, Segway tours and so much more! There are six beachfront accommodation styles, each set amidst luscious landscaped gardens and natural bush land. Or take up residency in one of the exclusive island holiday houses with million dollar views over Moreton Bay and the Glasshouse Mountains. 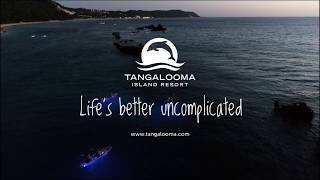 Your Tangalooma memory will last a lifetime! Feel like taking a lucky dip? Then the 'Run of House' room style is good for you. Great for the budget-conscious guest, as specific room types, features and inclusions cannot be requested or guaranteed. Note that Kitchenette facilities and Air-Conditioning cannot be requested nor guaranteed. No Daily Maid. Please also note the late 3pm Check-in time. Boat transfers to the resort are additional. Comfortable and spacious, the Kookaburra Lodge hotel rooms are a great choice for couples or young families and can accommodate up to four guests. All rooms feature air-conditioning, en suite bathroom with walk–in shower, hairdryer, television and DVD player, mini fridge, tea and coffee making facilities. Located just a short walk from the resort centre and only 50 metres from the beach, the Kookaburra Lodge is set in quiet and tranquil surroundings overlooking beautiful Moreton Bay. Each room opens on to a private furnished balcony, perfect for watching the magnificent sunsets over the water. The luxurious Deep Blue apartments offer guests absolute beach frontage. 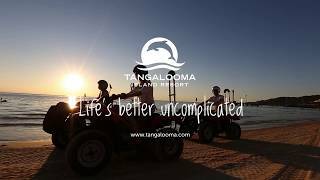 Situated close to the Tangalooma jetty, the apartments directly overlook the dolphin feeding area, and boast uninterrupted views across Moreton Bay, with the Glasshouse Mountains visible by day and the glowing lights of Brisbane City by night. With minimalistic décor and contemporary styling, each property is uniquely furnished. All apartments include stainless steel kitchen features European appliances, fully ducted air-conditioning, laundry with washing machine and dryer, indoor clothes line and private lock-up garage. Each apartment has its own furnished balcony complete with built-in barbecue and dining for up to 8 guests. Ceiling to floor automatic shutter blinds provide guests with complete privacy. The complex also offers a private pool with cabana. The luxurious Deep Blue apartments offer absolute beach frontage. 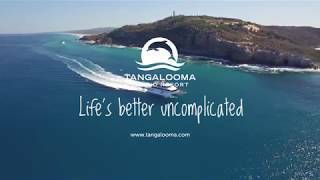 Situated close to the Tangalooma jetty, the apartments directly overlook the dolphin feeding area, and boast uninterrupted views across Moreton Bay, with the Glasshouse Mountains visible by day and the glowing lights of Brisbane City by night. Each apartment has its own furnished balcony complete with built-in barbecue and dining for up to 10 guests. Ceiling to floor automatic shutter blinds provide guests with complete privacy. Comfortable and spacious, the Kookaburra hotel deluxe rooms offer are a great choice for couples or young families and can accommodate up to four guests. All rooms feature air-conditioning, en suite bathroom with walk–in shower, hairdryer, television and DVD player, mini fridge, tea and coffee making facilities. The hotel deluxe rooms come with extra luxuries including wine and Baci chocolates on arrival, crisp white towelling bathrobes and slippers, and guaranteed ocean views. Furnished with relaxed island décor, the resort units are located only 50 metres from the beach. Featuring large sliding glass windows that allow ocean glimpses and fresh island breezes, the units overlook the pool, which is nestled amongst luscious tropical landscaped gardens. All rooms are studio-style and offer air-conditioning, en suite bathroom, hairdryer, television and DVD player, dining table and chairs, and kitchenette complete with full size fridge, convection microwave oven, electric frypan, toaster and kettle. Accommodates up to five guests. Capturing the island style, the resort suites are furnished for relaxed comfort and are located only 50 metres from the beachfront. All rooms feature air-conditioning, en suite bathroom, hairdryer, television and DVD player, dining table and chairs, and kitchenette with full size fridge, convection microwave oven, electric frypan, toaster and kettle. Surrounded by luscious landscaped gardens, tropical palms and native flowering bushes, the suites are also designed to take advantage of the refreshing Moreton Bay breezes from either a furnished balcony or through large sliding glass windows. The family suites differ from resort units in that they offer a separate bedroom and living area, offering more spacious living for longer stays. Each resort suite can accommodate up to five guests. 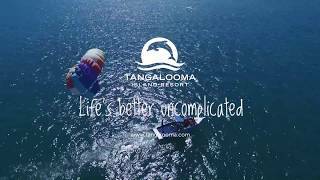 Tangalooma's architecturally designed holiday house offer unmatched, sprawling water views across Moreton Bay. Modern and spacious, they are perfect for families and larger groups. Spacious timber decks with outdoor furniture and barbeque facilities take advantage of Queensland's beautiful weather and are perfect for dining alfresco style or just relaxing and enjoying the views. Complete with everything you need to enjoy a relaxed and carefree holiday, each property has a stainless steel kitchen featuring modern utensils and appliances, and a laundry with washing machine and dryer. All the houses feature comfortable open plan living and dining area with ceiling fans throughout, and come with a private lock up garage. Located only a 15 minute walk from the resort centre, buggy hire is available at additional cost. The beachfront villas are a family favourite and ideal for longer stays as they are fully self-contained. Spanning two levels, these two-bedroom townhouses feature two private balconies with spectacular views across Moreton Bay. Furnished in relaxed island décor, the villas feature ceiling fans throughout. The upper level contains a bathroom, two bedrooms and an alcove with additional twin beds that is perfect for the younger ones. The spacious master bedroom has sliding doors that open to a private balcony. Spacious timber decks with outdoor furniture and barbecue facilities take advantage of Queensland's beautiful weather and are perfect for dining alfresco style or just relaxing and enjoying the views.